The first and most important step is simply to forget. Forget everything you know about tarot and start with a ‘beginner’s mind’. 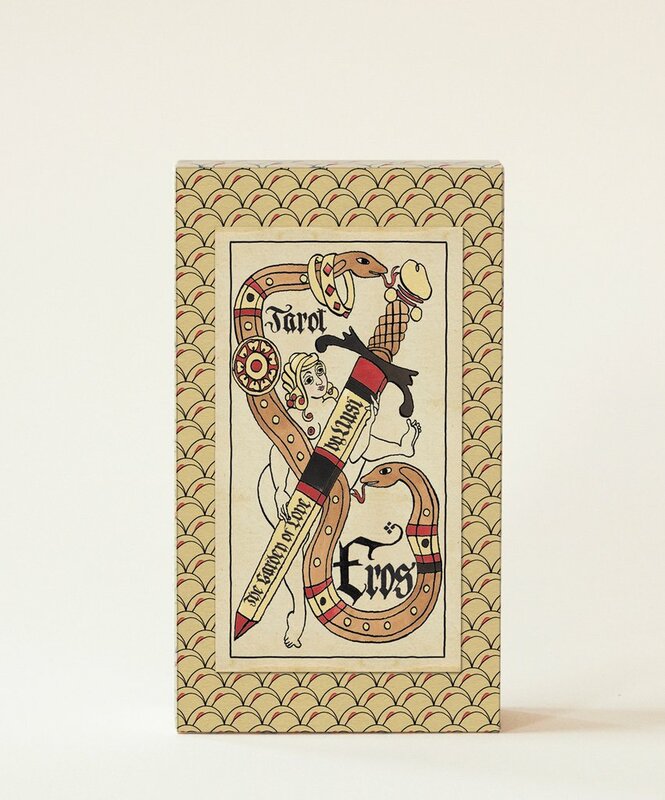 The Tarot de Marseille started out as a deck of playing cards – used for fun and pleasure. So approach these cards playfully! Do not overload them with extra meanings, esoteric philosophies and correspondences. Scholars agree the original cards were not encrusted with Kabbalah, astrology, hermetic philosophy, alchemy, etc. They were, and still are, just images to stimulate your imagination, thoughts and deeper unconscious processes. The best approach is to treat the TdM as you would paintings in an art museum. The Majors are like Medieval and Renaissance paintings, the Minors are like abstract, modern art paintings. Sure you could study the different art periods, the artists, the culture with guidebooks or extended research. But art deserves first and foremost to be appreciated with the eye, the mind, and the heart. Who cares ultimately what the ‘expert’ says the painting ‘means’? What does it say to you?! That is the meaning.There is no better expert than your own mind and heart for interpreting these amazing images. Always use a minimum of 2 TdM cards, according to Paul Richard. Always use a minimum of 2 cards. Cards never exist in isolation. 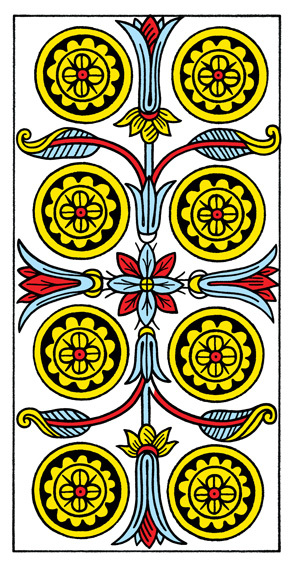 It is the interaction between the 2 cards or more from which we derive meaning. Many TdM readers use 3-5 cards in a straight line with no spread positions. Look at them as if they were panels in a comic or story book. Ask yourself, ‘What is happening in this story?’. Note that. Scan the cards quickly. What is the first emotion you feel? Note that. What details capture your attention, especially odd things? Note that. Note carefully any memories, emotions, thoughts, people, word associations, proverbs and sayings, that arise. No matter how silly, inconsequential, or unrelated it seems – note it well! Your unconscious and intuition use these languages to convey meaning! Make connections between these various elements and come up with a simple declarative statement rather than a whole paragraph’s worth of ‘this card means this, and that card means that, and…’. It may be hard at first to sift through all this information, but it will get simpler, if you stick with ‘less said is more conveyed’. Centuries of TdM readers, and a tradition that continues today for a vast majority of TdM readers – is to read only with the 22 Majors. Experts use it, and so can beginners. The Majors get quickly to the heart of the matter. They are powerfully evocative. 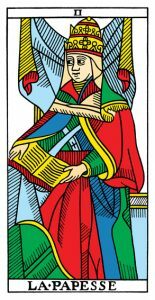 There is no question that can’t be answered fully, and deeply, with only the 22 Majors.The superstition that Majors are only for big spiritual ‘major’ life things and Minors are for mundane, everyday ‘minor’ things is a mistake in understanding the true nature of the tarot. Majors are quite frankly more accessible and immediate than the pip Minors. Their advice is more direct. Begin there. As you grow more comfortable you can add in the pip Minors and Courts. Or do as many of us do – use the Majors for the spread, then use the Minors and the Courts laid upon each Major card that you want practical advice and strategies for implementing. 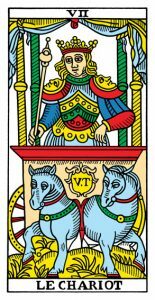 Ace of Batons (wands) Tarot de Marseille. Aces are 1: beginnings in numerology. Numbers have for millennia held deeper meanings. The numbers 1-10 of the Minors hold similar significance. Find a numerology system that makes sense to you, that is easily memorized, e.g., 1 = beginnings, 2 = dialogue, 3 = creativity, etc. Some systems are process oriented, as in 10 steps from idea to completion of a project. I developed a system, inspired by the flowers and vines on the TdM Minors with Aces = Seeds to 10s = Plants releasing their seeds for a new cycle to begin. Finally the most popular TdM numerology system uses the first 10 Majors as archetypes for each of the 10 numbers. 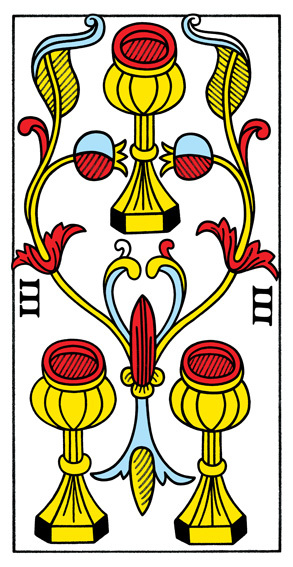 Thus Ace = Magician = create a new reality, 7 = Chariot = achieving success through mastery, etc. All you need to do now is combine the suit meaning with the number meaning. Play with all the possibilities! One or more of those possibilities will apply directly and clearly to the questions asked of the cards and its spread position. What to do about all these flowers, vines, and objects? Many TdM readers use straight numerology and suit meanings to produce state-of-the-art, deep and transformational readings. Yet some like to add in the subtle nuances of all those flowers and vines and geometric arrangements of coins, cups, swords, and batons to their interpretation. This referred to as ‘eye rhymes’ or the ‘language of the birds’ by tarot masters such as Enrique Enriquez. Look closely at those patterns. Allow your imagination to play, just like you do when you make pictures out of fluffy cloud formations. What does the arrangement of pips and florals remind you of? When I look at the 3 of Cups, I see a flower bud enclosing the third cup and the stable ground of the other 2 cups; a plant starting to bud. Aha! Birth! Maybe it’s a birth of a new direction, or a relationship springing from a stable foundation of 2 friends. 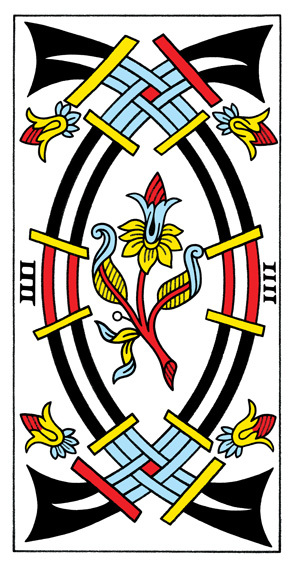 In the 4 of Swords I see a luxuriant plant in full bloom because it is safely protected behind a fence. Thus a stable mind allows for abundant growth. In the 8 of coins, each separated by a wall of vines, I see office workers in their separate orderly cubicles. Thus a hierarchical organization, or well invested resources. The biggest mistake that new TdM readers make, is to cut and paste WCS or other deck meanings onto the TdM cards. This is especially dangerous with the pip Minors because of their abstract nature. Resist this temptation at all costs! Or you will sacrifice one of the greatest values of the pip Minors – their ability to go far above and beyond the range of interpretations that a scenic minor gives. Most of you know the standard interpretations of the 9 of Swords and the 5 of Cups in the Waite-Smith. In the 9 of Swords the image alone speaks volumes – a sword breaks through a seemingly insurmountable impasse. 9S numerological is success and rewards, and swords are thinking – thus a creative and innovative breakthrough strategy, a successful team collaboration, etc. In the 5 of Cups – 5s are challenges, new avenues and possibilities that upset the stable control of the 4s. Cups are emotions and relationships – see all that abundant growth around the 5 cups – a new stage of growth in the intimate relationship, a flowering of new emotional abundance and fruitfulness following a challenging stage of growth. The WCS meanings also do not apply to the Majors, e.g. the Magician. Notice he is not the high ceremonial magus of the WCS, he is a street-performer, a con man, a trickster. 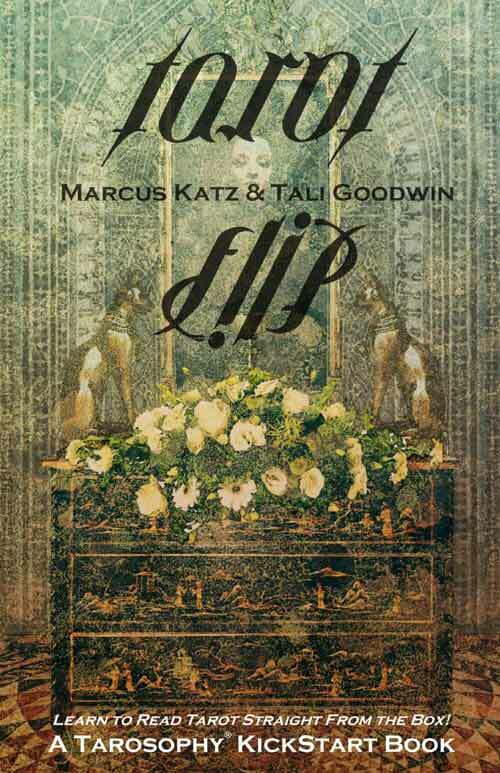 It speaks to a skillful manipulation of reality, an improvisation, talent. The Tower is not destruction and doom – it is ‘God’s House’ the medieval term for a hospital, a place of healing. The image does not picture a tower falling but one whose crown is opened up to receive divine illumination, surrounded by heavenly(?) beings descending from on high to help. It is healing illumination and inspiration. Always begin with Yoav ben Dov’s excellent Tarot: The Open Reading. It truly is the most accessible and foundational TdM book on the market today. 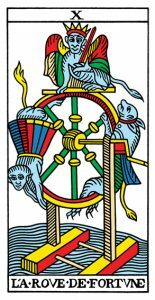 Jean-Michel David’s Reading the Marseille Tarot will give you the history and the Medieval and Renaissance culture, symbolism and iconography of the TdM. 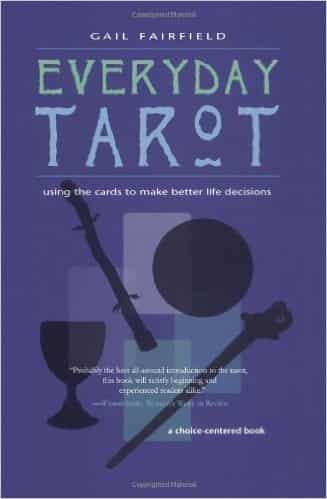 A. Jodorowsky, The Way of Tarot, The Spiritual Teacher in the Cards – while controversial – creates a spiritual basis for the entire deck as a whole and complete entity, with its own internal logic and consistency. How do you navigate these different meanings? First, and most crucially, let the image simply speak to you. Secondly solid, scholarly, well-researched books on the TdM will definitely help (see table). Yet I still strongly advise no books or blogs or videos for 6 weeks starting out. The only way to be a truly great TdM reader is to use the cards without your mind being clouded and cluttered by every expert opinion and keyword dictionary. Once you have developed a deep familiarity with your deck(s), then those authors I mentioned above, and teachers like myself, will provide a great and enduring resource – supplementing, not supplanting, your knowledge and experience. Then their words will inspire, take you down new roads and avenues, broaden your understanding and experience. But only if you first have the experience to broaden. Remember your clients come to you for your wisdom and understanding, not mine, or any other tarot expert. You are the magic. You are the seventh and final key! NB. All TdM imagery is from the Conver-Ben-Dov Tarot de Marseille by Yoav-Ben Dov, number one in our Top Decks article. Paul H. Richard, M.Div, is a Spiritual Elder and Guide (professionally and in lineage) in the Celtic, Indigenous-Aboriginal American and Western spiritual traditions. He’s trained in archetypal psychology, Evolutionary Astrology and Tarot and has been reading for 40+ years. 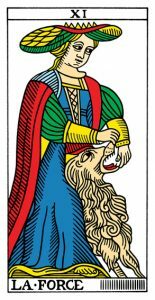 While he’s familiar with other tarot systems, the TdM is where his true heart and expertise lies.